Giacometti 'Walking Man' Sculpture Sells For $104.3 Mill Auction Record : The Two-Way An anonymous purchaser spent $104.3 million on a six-foot tall stick-man sculpture by Alberto Giacometti. The sale at Sotheby's in London Wednesday evening set a new record for an art work sold at auction. This Giacometti sculpture, "L'Homme qui marche I" or "Walking Man 1" has walked into the record books, selling at auction for $104.3 million. With so much of the news these days being about the dark economic clouds of budget cuts, unemployment and foreclosures, it's good to know there are still some people out there who not only can see a silver lining but own it. And not only do they own it but they own so much of it that they can afford to spend $104.3 million on a six foot tall stick-man sculpture by Alberto Giacometti, one of the 20th Century's most important artists. The sale at Sotheby's in London Wednesday evening to an anonymous buyer set a new record for an art work sold at auction. 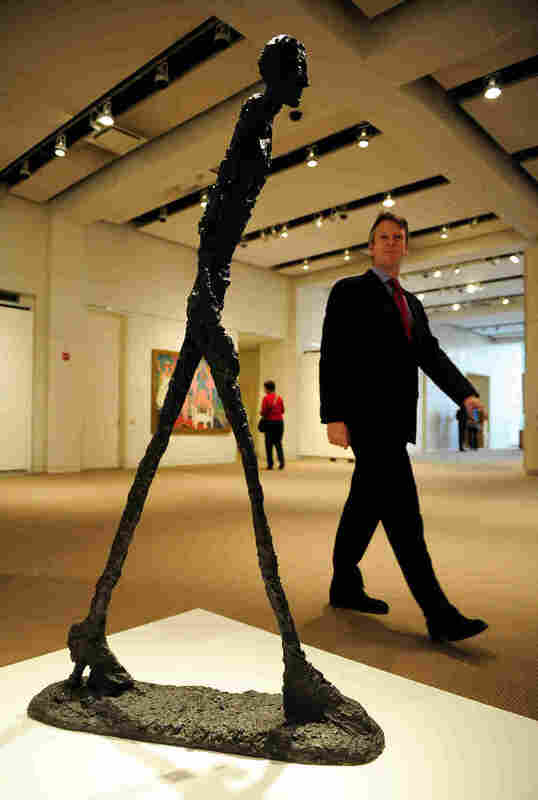 Alberto Giacometti's 1960 sculpture of a spindly man, "Walking Man I," sold for 65 million pounds ($104.3 million) in a Sotheby's auction, shattering the record price for a work of art at auction and signaling a potential resurgence in the art market. In a tense contest at the company's London salesroom, bidding began at ? ?12 million and then escalated, with roughly 10 bidders vying for the sculpture. The winner, who pays the final bid plus Sotheby's commission, bid over the telephone through Philip Hook, senior director of Sotheby's European operations, and chose to remain anonymous. The 6-foot-tall bronze depicts a wiry man in mid-stride, his right foot jutting forward, his head erect and and his arms hanging at his side. Giacometti, a modern master known for his haunting sculptures of blank-faced Everymen, cast the work 60 years ago as part of a commission to plant several of his bronze figures on Chase Manhattan Bank's Pine Street plaza in New York City. The artist famously struggled with the project, eventually quitting it but casting stand-alone versions of several of the planned figures, including "Walking Man I." The price breaks the existing $104.2 million auction record, set six years ago at Sotheby's, for Pablo Picasso's 1906 portrait "Boy With a Pipe," whose buyer remains unknown. Actually, I'm quite jealous of whoever bought the Giacometti. One, because of the size of the fortune you'd have to have to part with more than $100 million for a work of art and two, because who wouldn't want to own one of Giacometti's uniquely skeletal like figures in his home?